Tracing the history of Stanley Cup competition, one legendary series looms above all others as one of the most peculiar games in a Stanley Cup final. 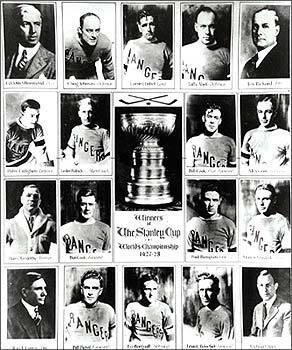 It occurred April 7, 1928; a game between the New York Rangers and the Montreal Maroons. The Rangers finished the regular season in second place in the American Division while the Maroons had a similar finish in the International Division. The Rangers eliminated the Pittsburgh Pirates and the Boston Bruins to reach the Stanley Cup final. The Maroons dropped the Ottawa Senators and Montreal Canadiens to earn their spot. 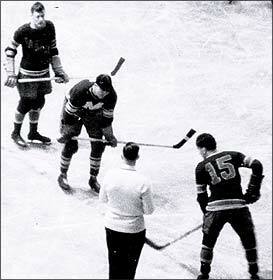 The championship series was odd even before the face-off of the first game between the Maroons and Rangers. In what was an annual example of shortsightedness (or commerce opportunity), the Ringling Brothers Circus was booked in for an extended stay at Madison Square Garden, so the Rangers had no place to play their home games. "We had to play all the games in Montreal because the circus took over the rink," recalled Bun Cook. The Maroons were up one game to none in the championship final. In Game 2, played on April 7, an injury put a temporary halt to the game. "(Lorne) Chabot got hit in the eye," recalled Cook. "It delayed the game for awhile." At the four-minute mark of the first period, a shot by Nels Stewart caught the Rangers' netminder in the left eye. The game was delayed twenty minutes while Chabot was rushed to Montreal's Royal Victoria Hospital. Alec Connell, the Ottawa Senators goalie, happened to be at the game and the Rangers asked permission to use him as an emergency replacement. The request was denied by the Maroons. "They couldn't agree on a replacement goaltender so Lester said, 'Well then, I'll play.' It took a lot of courage." 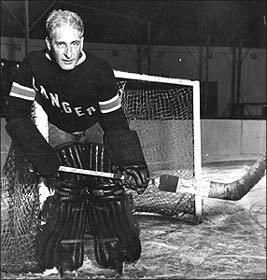 While the 44-year-old Lester Patrick pulled on Chabot's equipment, Odie Cleghorn, the manager of the Pittsburgh Pirates hockey club, offered his services to coach the Rangers while their boss was in goal. "We just tried to keep the game going," recalled Bun. "In those days, one goal could do it. There were very few high-scoring games." Bill Cook scored at the thirty-second mark of the third period to break the scoreless deadlock. "I think we got a goal and then they tied it up," Cook remembered. Nels Stewart of the Maroons scored at 14:20 of the third to tie the game at one. The contest went into overtime. Frank Boucher ended the game with a goal at 7:05 of the first overtime period. "We went ahead. It was a 2-1 game," Bun said. "But Lester, he did some wonderful acrobatics stopping the puck. They didn't get too many chances. I can still see the sweat running down off of him after the game!" Lester Patrick, the 'Silver Fox,' faced eighteen shots over 63 minutes and allowed just one to get past him to give his team the win. New York went on to win the best-of-five series three games to two to capture the franchise's first Stanley Cup championship. "I think we got a thousand dollars for the Stanley Cup when we won it the first time and that was a lot of money in those days," mentioned Bun Cook. "And a gold watch. Lester gave us that." Kevin Shea is the Editor of Publications and On-Line Features for the Hockey Hall of Fame.